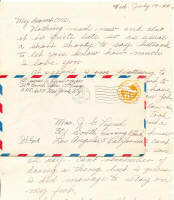 This letter was written by a Lt. who was with the 34th Bomb Squadron, 17th Group. That is the same squadron and group that the famous James Doolittle was with. The letter was written on July 19, 1944. From the letter….. Nothing much new and also it is quite late so as usual a short shorty to say hello and to let you know how much I love you. At present I am listening to Bob Hope guess I forgot to tell you that we now have a radio. It is an Italian job, we bought it from Bohlan. He is going home so we took it off his hands. Spent a very busy day. Can’t remember doing a thing but I guess I did manage to stay on my feet. Say I believe that a tan is developing, not sure as yet but the red seems to be changing color. At present I am quite a two tone job, imagine I will remain that way too because I don’t dare chance getting my rear sunburned (spend too much time on that thing) Hope you don’t get frightened when you see this two toned job advancing toward you in your boudoirs. Certainly hope that time isn’t far off. Well sweetheart I must say goodnight for now and a million kisses. Write often sweet I love so much to get your letters and I haven’t had any for three days. I love you darling with all my heart, body and soul. Sadly this Army Airman never made it back home to his wife. He was killed in action, and was buried in an American Cemetery in Florence, Italy. You have an amazing blog. Thank you so much for sharing.